Let's be honest, one of the reasons we really wanted to go to Hawaii was because of the shopping. Whilst I love Australia - we just don't have the same variety of stores that are available in the US - so shopping was pretty high up there on the "must do" list whilst in Hawaii. 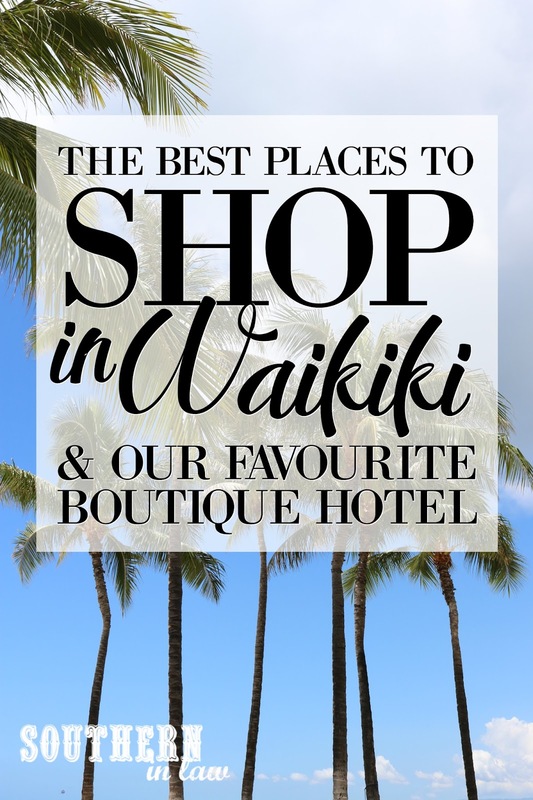 Today I thought it would be fun to share our favourite places to shop in Waikiki - as well as the best boutique hotel to stay at that will put you right in the heart of retail heaven. These shopping spots are the best of the best - including a few hidden gems. You won't find run of the mill overrated outlet mall recommendations here! Disclosure: We stayed as guests of Coconut Waikiki - but genuinely loved staying there and thus, all of these words come completely from our brains and have not been influenced by the company in any way. This is NOT a sponsored post! First, let's start with the accommodation. 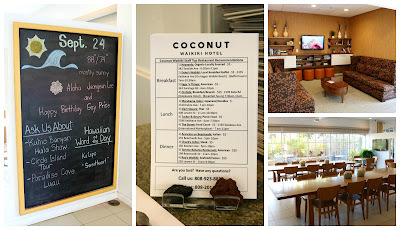 The last bit of our trip saw us calling Coconut Waikiki Boutique Hotel home. It's a newly renovated hotel in the area that's a bit of a hidden gem - as most people I spoke to had no idea what I was talking about. 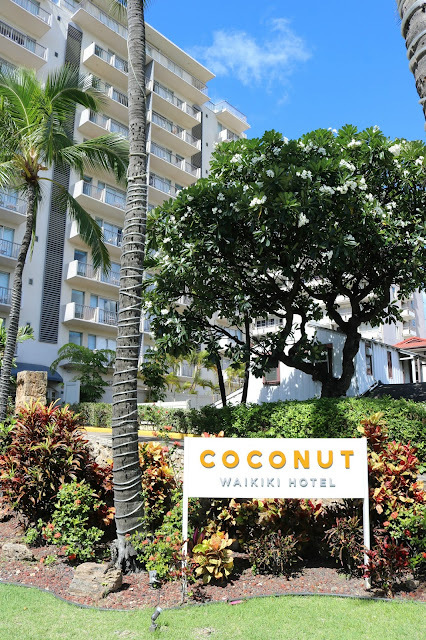 Coconut Waikiki has so much to offer. Incredible staff who are always on hand to answer questions, recommend places to eat or shop and lend a helping hand. All the amenities you could need (barbeques, a swimming pool, a private lanai, complimentary WiFi, board games and beach towels to borrow - even a complimentary daily continental breakfast - and whilst we were there they even had free popcorn one afternoon too!) 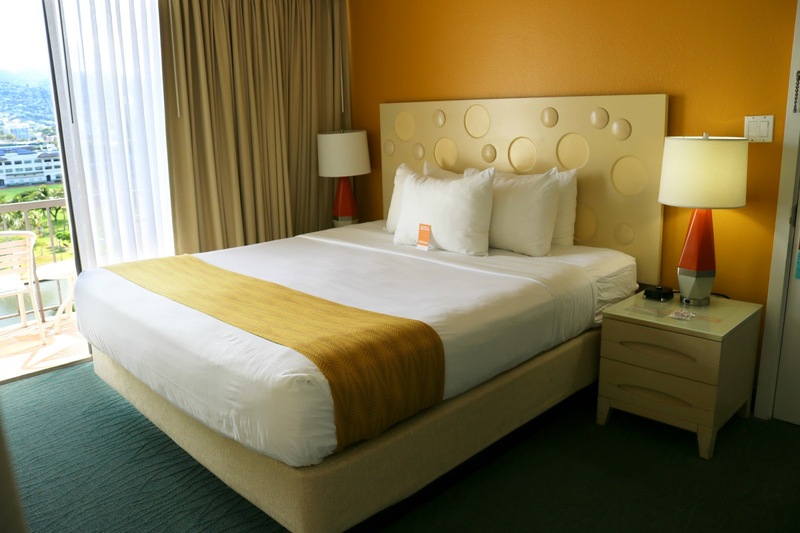 and a cosy room to act as your home away from home. 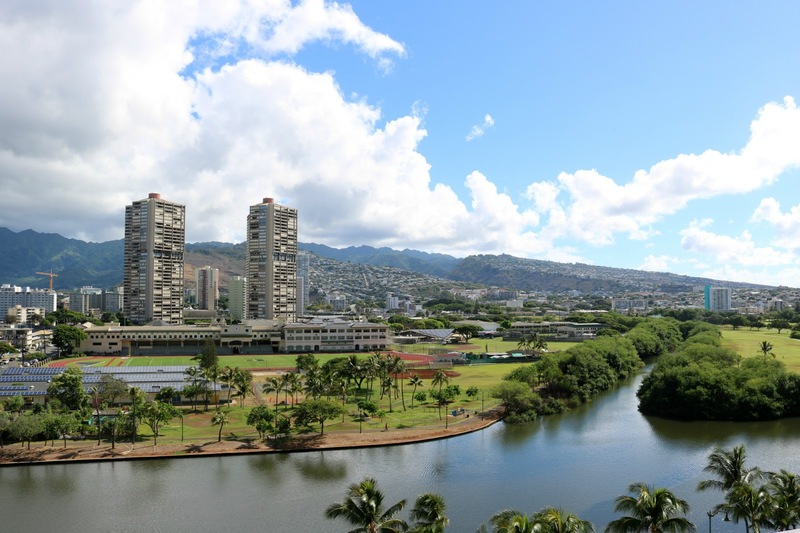 It's also super close to the beaches and shopping along the boulevard and close to public transport to get you to places like the Ala Moana Centre, Pearl Harbour and more. We stayed in a Mountain View King Room which had everything we needed - and the cosiest comfiest bed. I was a little worried about traffic noise after reading a few reviews - and seeing earplugs on the bedside table - but I'm proud to say this light sleeper didn't wake once during the night and the earplugs remained untouched! Also in our room was a little kitchenette with microwave, mini fridge, Keurig coffee maker and cutlery and crockery. Whilst it's not suitable for cooking extravagant meals, it was perfect for the one night we stayed as I was able to find things I just needed to reheat. 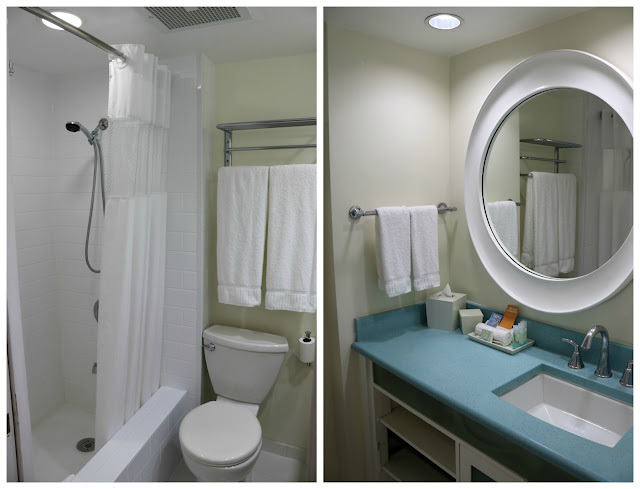 We also had a full bathroom that was light, bright and clean - and had an almost nautical theme with the colour scheme and round mirror. But the best part of all? The view. Our room looked out over the Ala Wai Canal at the Ko'olau Mountain Ranges and it was absolutely incredible. Hawaii is so lush and green and the view of the mountains is constantly changing as the clouds and storms roll in and out. But you want to find out about the shopping, don't you?! Here's our list of the top places to shop in Waikiki! Ross Dress for Less - similar to TJ Maxx, Ross Dress for Less has a huge range of discounted clothing, homewares, shoes and accessories. We went to quite a few stores but found the best one was actually the one that was the most run down - 333 Ward Avenue. This store was away from other shops and it was the least crowded so they actually had the best stock inside. Nordstrom Rack - similar to TJ Maxx and Ross Dress for Less - only Nordstrom Rack only sells items that were originally stocked in Nordstrom (as far as I'm aware). Think of it like the Christmas/Black Friday/holiday sales year round. You can pick up designer items at teeny tiny prices. The Ala Moana Center - This is a popular mall - but all for good reason. The Ala Moana Center has just about every shop you could need as well as free hula and cultural performances every day. It's busy but it doesn't feel overcrowded - and you'll find everything from Target (which unfortunately opened just after we left!) to Chanel and Gucci and everything inbetween. The Aloha Stadium Swap Meet - Now, you might be like me and wondering what a "Swap Meet" is. I was wondering if we'd even be able to get in because I didn't know what on earth I was supposed to swap - but let's just say it's more like a flea market style thing. They have hundreds of stalls with plenty of touristy items. You'll find Aloha shirts, bags, hats - and plenty of fresh coconuts to sip on too. Entry costs $1 per person and the marketplace is open Wed, Sat and Sun from 8am-3pm. Warning, it does get really hot there on a hot day as you're walking around so make sure you bring plenty of water and sunscreen! Also, if you're after one particular item, don't necessarily buy it at the first store - most of the stores sell the same stock at different prices. If you've been to Bali, it's kind of the same - only without the haggling. Rock Island Cafe - If you're looking for the best place to find Elvis Souvenirs in Waikiki, Rock Island Cafe is the place to find them. They have every kind of retro rock and roll souvenir you could think of - and it's a really cool place to visit. ABC Stores - ABC Stores are everywhere and have plenty of little souvenirs to take home. They are literally on every corner so have a look around and see what you can find! Santa's Pen - If you're like us and like to buy a Christmas ornament to remember your travels, Santa's Pen is a must visit. They have so many gorgeous ornaments and offer free personalisation. We got a bauble with sea turtles on it to remind us of our trip. Do you like to shop when you're on vacation? What kind of souvenirs do you like to bring home? And are you a bargain hunter like me?